Readerware 3.15 and above are supported on Mac OS X Mountain Lion, (10.8), and all features work normally. This is because functionality that was previously a standard part of OS X is now considered optional. Click on the Install button. The OS X Software Update program will be launched to download and install the additional software from Apple. The download is approximately 66MB. When that completes Readerware will be launched automatically. 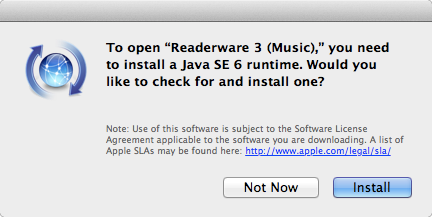 The Mac OS X Mountain Lion install removes any existing versions of Java installed on your system. So you will have to go through this download step even if you had done it on an earlier release of OS X.